Let’s continue our breakdown of the the new prospects the Yankees received in the various trades they made on and around the trade deadline. In this post, we’ll take a look at a guy who was previously the number one prospect in the Chicago Cubs’ system, and now sits in second place in the Yankees system (due to the fact that they also traded for Clint Frazier). If there’s one position at the Yankees have plenty of organizational depth, it’s shortstop. For one, they have Didi Gregorius under contract until at least 2020. Gregorius has taken a huge step forward with his bat this season and when you combine that with his gold glove potential fielding, he’s looking like a guy that might make a few All-Star teams before he leaves the Bronx for good (assuming he ever does). Furthermore, the minor league system is also stacked with shortstops. In fact, after this weekend, six of the Yankees’ top 30 prospects can also play shortstop. There’s Jorge Mateo (#3 in the system), Wilkerman Garcia (#12), Tyler Wade (#15), Hoy Jun Park (#23) and Kyle Holder (#28). I know what you’re thinking; that’s only five guys, Martin! I know, bro. That’s because the other guy is the subject of today’s post. Say hello to Gleyber Torres–the center piece of the group of prospects (along with Rashad Crawford and Billy Mckinney) that Brian Cashman got when he dealt Aroldis Chapman to the Cubs a week before the deadline. Did the Yankees need another shortstop in the system? Not necessarily. However, shortstops are usually among the most athletic players in the system, which means they can be moved around to different positions all around the field. Also, when you have a chance to trade for another team’s best prospect, you don’t hesitate to pull the trigger. Anyway, let’s get to it. “Part of Chicago’s $8.2 million international signing spree in 2013, Torres signed for $1.7 million out of Venezuela on the strength of his advanced bat and potential for solid tools across the board. He has a quick right-handed swing and a mature approach, recognizing pitches well and using the entire field. Now that he’s starting to get stronger and learning to pull pitches more often, he could produce 15-20 homers per season. As it says above, Torres signed with the Cubs out of Venezuela as a 16-year old in 2013. Despite the fact that he’s barely 19 now, Torres had made it all the way to A+ ball in the Cubs organization. When he got to the Yankees, they sent him to A+ ball as well, where he is now enjoying that oh so beautiful Tampa weather. As he did with Frazier, Cashman had something interesting to say about Torres, calling him a “high-level prospect that’s extremely valuable within the industry.” Now, I’m not gonna make a stop at Speculation Station and pick up a couple of conspiracy nuts, but Cash knows damn well that not all Yankees prospects are meant to end up in the Bronx. Some flame out, but some are used as trade chips to bring in established major league talent. I can guarantee you that, while the Yankees will use their now top-notch minor league system to fill positions on the Yankee Stadium field, a couple of these guys will probably end up being packaged for some a star-caliber player. Could it be Chris Sale this offseason? Maybe. I dunno. OK, now that that’s out in the ether, Speculation Station is closed, bro. If the Yankees do decide to make it big from within, they have a potential solid piece in Torres, and it’s clear the Yankees are pretty impressed with the 19-year-old. Former top prospect Jorge Mateo was already learning second base down in Tampa, but Torres’ arrival made the switch official. Mateo has had some struggles this season, and he made it all worse with some behavioral issues, but these two have to be arguably in the top few middle infield combos in the minors. If both of these guys reach their full potential, the Yankees could end up with an epic double play duo. So far this season, Torres is hitting .271/.356/.424 with 25 doubles, 3 triples, 9 homers, 49 RBI and 19 SB. Obviously, most of that was done with the Cubs affiliate in Myrtle Beach. Since joining the Yankees, he’s got 5 hits in 24 ABs (.208), but a couple of those knocks are doubles. I’m sure he’ll adjust nicely to his new surroundings in the next couple of weeks. After all, he’s just a kid–a few years younger on the average than everyone else at his level. According to scouts, the 6’1”, 175 lb Torres should be able to add some muscle to his frame and, as the report above says, might eventually be a 15-20 homer guy. His speed, although about average, lacks technique right now, as he’s been thrown out 11 times. He’s not going to be the speed demon that Mateo projects to be, but I could see him hitting double digits if he can figure out the nuances of base stealing. Defensively, he might lack the quickness to stick at shortstop, but he has a good arm, which could make him a nice option at third base if Chase Headley’s contract ever ends. Hell, he could even switch back to 2B and let Mateo get back to SS, as the Yankees are also having him learn that position in Tampa. When you have talent, and your bat plays, teams will find a place to put you on the field. “I just know a little bit about the kid Torres,” Castro said. “He’s pretty good. We worked out together one year before spring training. And I think he’s pretty good. I think he’s good. He’s got talent. He’s got really good strength. He could play defense. He can run. He’s a really good athlete. That was a good quote by Castro. Very good. Good talking, Good information. Pretty good. (I kid. We love you, Starlin). 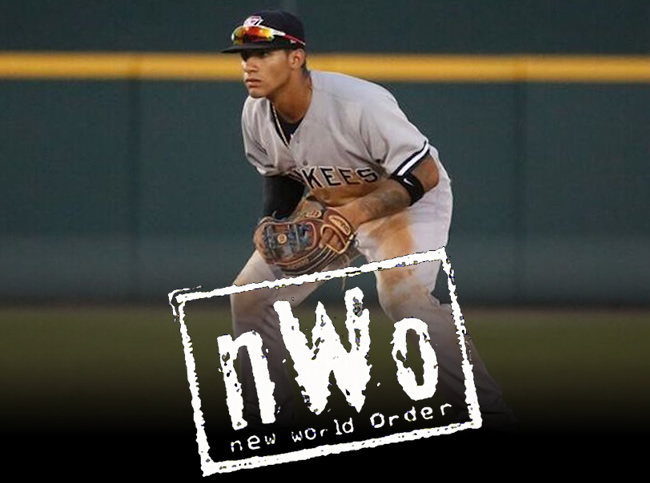 So when will we see Gleyber in the big leagues? Although he is advanced for his age, we’re still looking at another few years before he is ready to come up to the big leagues. Pipeline has him slated for a 2019 arrival, and they’re usually pretty accurate with their stuff. Incidentally, 2019 is also the predicted year for Mateo’s big league arrival, as well as the last year of Castro’s contract and the penultimate year of Didi Gregorius. I know. I know. I said Speculation Station was closed, but it turned out there was one more train to go. Anyway, as Yankees fans, we should be extremely happy to have a prospect like Torres in the fold. He’s now the team’s second best prospect, and we’ll keep tabs on him as his game develops. Hopefully, we’ll see him in pinstripes in a couple of years.